Every students desires to complete the learning program and also set a much higher goals for themselves. Being awarded a scholarship is one of the big dreams that everyone has ever thought of. Scholarship not only brings you a certain amount of money to cover your expenses, but also a great honor and encouragement to study and practice much better. Students are the center of all activities. Van Lang University always creates the best conditions for them including the provision of exact and timely information for students about scholarships: Scholarships of the University, the faculty or external scholarships such as Alumni Scholarships, other organizations, etc. 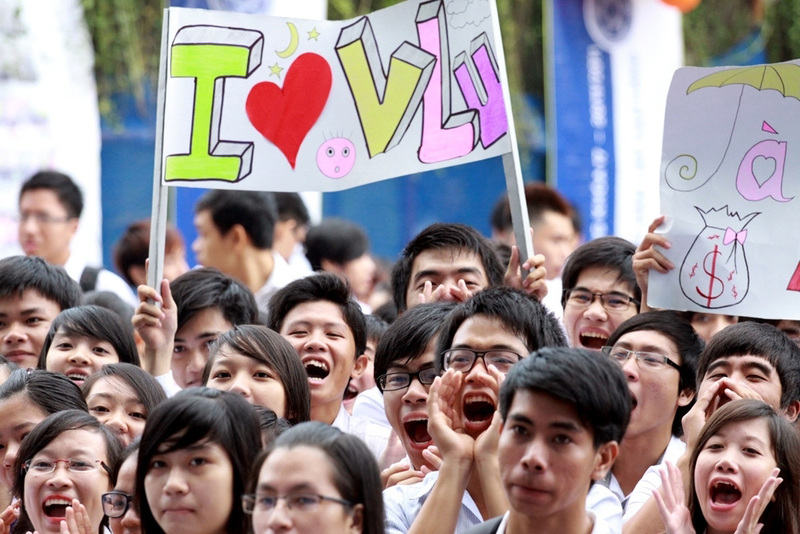 The scholarship of Van Lang University has a familiar name: VLU Scholarship. As long as you strive to achieve your goals, the VLU Scholarships will be awarded to your learning and training efforts, at various levels. In 2017-2018, Van Lang University has awarded 3,831,225,000 scholarships to students. Level 1: 100% tuition fee of the semester that will be awarded scholarship. 1 scholarship/faculty (valedictorian scholarship). Level 2: 50% tuition fee of the semester that will be awarded scholarship. 5% top students of faculty/course. Level 3: 25% tuition fee of the semester that will be awarded scholarship. 10% top students of faculty/course. Level 4: 15% tuition fee of the semester that will be awarded scholarship. 30% top students of faculty/course. Level 5: 10% tuition fee of the semester that will be awarded scholarship. 55% top students of faculty/course. With some specific majors, School will apply these criteria in the suitable way. Object: Students are studying at Van Lang University up to the time of considering scholarship. After school activities grade from 70 scores to higher. Note: Excellent graduates will receive rewards from school; no scholarship for students in the last semester of the final year. For those students who meet 2 conditions above from high to low and from level 1 to level 5 until the end of the list of eligibility for scholarships. In cases students have the same GPA, the one with higher after school activities grade will be chosen. Level 1: 75% tuition fee for valedictorian of each major. Level 2: 50% tuition fee for salutatorian of each major. Assoc. 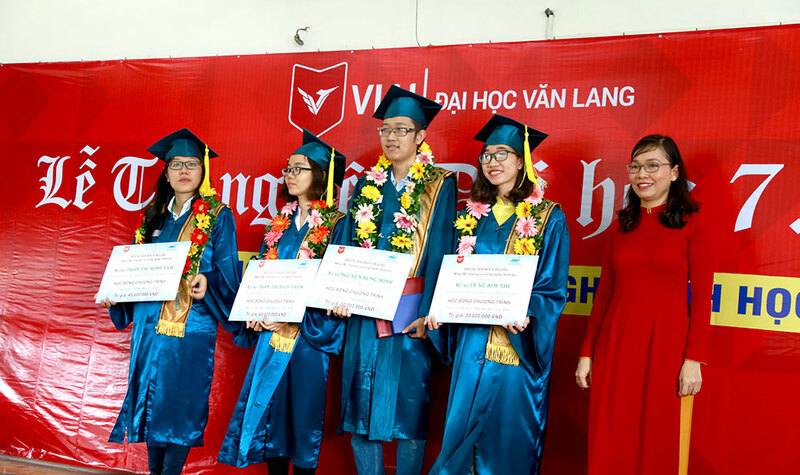 Prof. Ph.D Le Thi Kim Oanh – Dean of Faculty of Environment & Biotechnology awarded scholarships to the valedictorian and salutatorian of Environmental Engineering Technology and Biotechnology, graduation ceremony in July, 2018. Faculty of Commerce and Business Administration: VND 2,000,000/person, 45 scholarships/year. Faculty of Commerce and Business Administration also awards 6 scholarships/month for students who have difficult condition. VND300,000/month for each student. Students will be supported during 10 months/ year from 1st year till graduation. Faculty of Finance and Accounting: VND500.000/person, 20 scholarships/year. Faculty of Environment and Biotechnology supports students' scientific research activities: 100% expenses for students conducting researches that are recognized by the Science and Training Council of the Faculty. In addition, students of Faculty of Environment & Biotechnology will be provided with 100% of training costs when participating in professional training courses and skills training courses of Vietnamese and foreign experts. Mitsubishi Electric Vietnam Scholarship: for students in Heat Engineering major. Mitsubishi Electric Vietnam awards VND60,000,000 for students whose GPA are good; VND2,500,000 – 4,500,000/person. Requirement: Average GPA from 7.0, good behavior and be active in youth movements; Not having received any scholarship from other companies which are in the same industry with Mitsubishi Electric Vietnam. Priority: students have scientific researches recognized by the University, students in difficult condition proposed by the University. Mr. Dang Nguyen Ngu - Representative of Mitsubishi Electric Vietnam (outermost, left), MSc.Vu Hong Diep, representative of Faculty of Engineering, Van Lang University (outermost, right) awarded scholarships for 10 outstanding students, Heat Engineering major. Companion Scholarships VND8,000,000 (GPA ≥ 7.5). Requirement: Recent average GPA from 7.5 to higher, after school activities grade from 65. 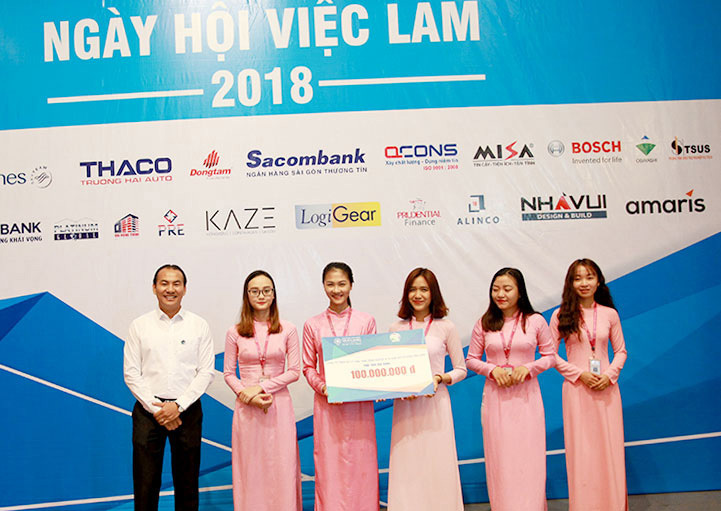 Students who have difficulties in financial condition, priority those who used to receive Huynh Tan Phat scholarship in the past, actively participating in social activities, and had prizes at architectural competitions. DXC Technology Scholarship: For students in Faculty of Information Technology. Every year, DXC awards 10 scholarships for excellent students, VND5,000,000/person. DXC will also provide internships and employment for third year and last year students. Scholarship from Environmental Companies: for students in Environmental Engineering Technology major. Excellent students will receive VND10,000,000/year. Students with difficult condition recognized by faculty and have good result will receive VND2,000,000/month. Scholarship from Biotechnological Company: for students in Biotechnology major with achievement in scientific research. VND3,000,000/research. Mr. Lam Tan Qui - Director of Van Lang Co., Ltd. (Alumnus of Van Lang Environmental Engineering Technology) awarded scholarships to students in Environmental Engineering Technology and Biotechnology Mar, 2018.